Michael Jackson’s death started off a chain of ugly legal battles—involving his music, home, money, children, and personal effects. From a non-legal standpoint, it looks like his will was pretty disorganized for there to be so much bickering about his estate. 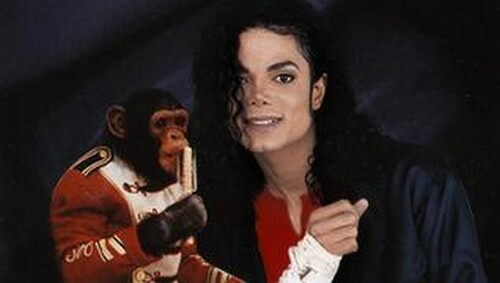 On top of everything, the late King of Pop forgot to make sure his beloved pet chimp Bubbles would be cared for should anything happen to him. Now, his surviving family has abandoned Bubbles and refuse to pay any of the bill for his care. A source reported to National Enquirer, print edition December 31, 2012, “Bubbles was not provided for in Michael Jackson’s will. The Jackson family has turned their backs on Bubbles.” The chimp’s care is estimated to cost $20,000 per year. He currently lives at the Center for Great Apes in Florida, which is a habitat for “retired” or abandoned animals. Patti Ragan, the founder of the animal sanctuary, explained that Bubbles is healthy and forming healthy relationships. “Bubbles lives with a group of seven chimpanzees, three males and four females, and it looks as if he is becoming the dominant male in his group. He has a good life, good nutrition, and lots of climbing and play activities.” Of course, we are thrilled to hear that Bubbles is being housed by professionals, and not Twitter and eyeliner obsessed 15-year-old Paris Jackson, but it’s still pretty disgusting that Michael’s surviving family would abandon his loved pet this way. Bubbles was adopted by Michael as a baby; he was being used for medical research and was rescued by an animal trainer. Michael even taught Bubbles to do the moonwalk—you can check it out on YouTube. He obviously loved the chimp dearly, but his greedy relatives would rather take the $500,000 Bubbles will require during his last 30 years of life and spend it on themselves. Yet another example of Jackson family greed! What do you think of Bubbles’ abandonment? Should the family be contributing to the sanctuary for his care, or is it no longer their responsibility?